To celebrate, I had a Dunkin Donut (guess which flavor?) and a large coffee. I noticed that my cup bore a strange resemblance to a mustachioed man. Do you think this is deliberate? 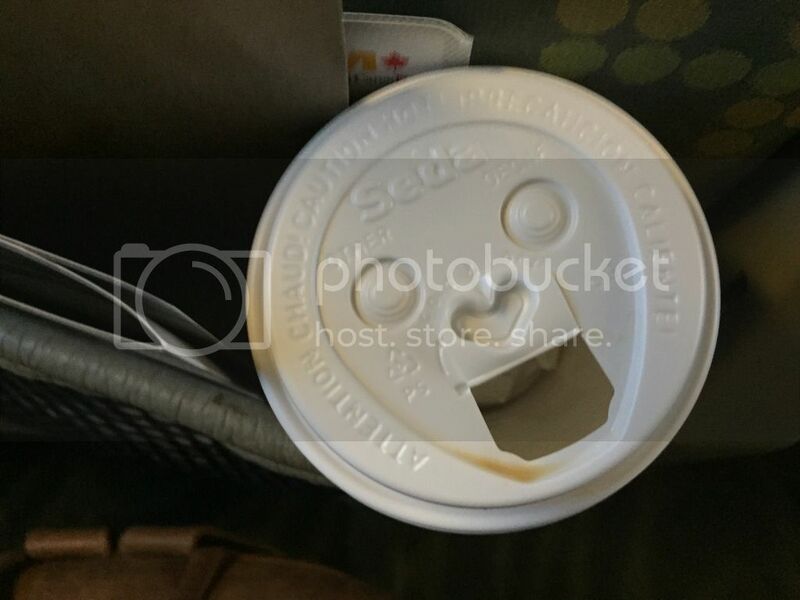 After all, wouldn’t you be happy if you were dispensing coffee to tired travelers? This entry was written by whyevolutionistrue and posted on April 13, 2018 at 9:30 am and filed under travel, TSA Follies. Bookmark the permalink. Follow any comments here with the RSS feed for this post. Both comments and trackbacks are currently closed. Maybe after years of screwing up, TSA is becoming reasonable. Besides, most of the bombs go with check in. 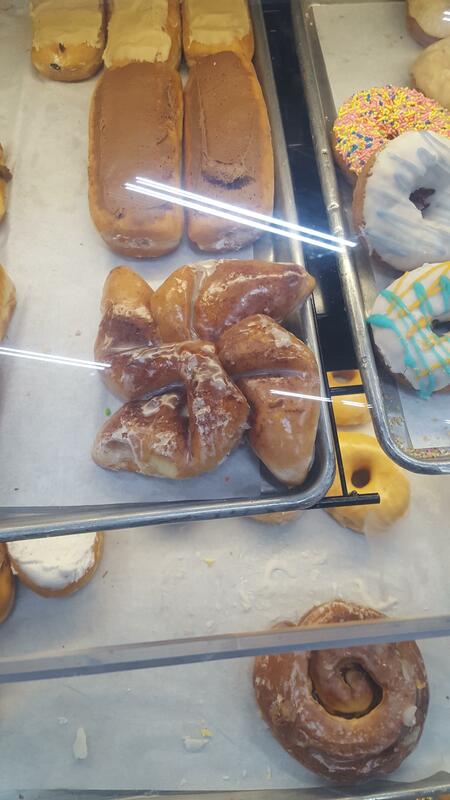 If your donut looked like this, there’s trouble at Dunkin Donut. Kissing that face for a coffee doesn’t make it more appetizing. I’d still do it for coffee, though. Did you have a frosted donut that looks like Jesus? WINNER: Double chocolate glazed with chocolate. Jerry, you are such a human! A lucky one, at that! I never ever eat/drink while walking so I’ve not seen a lid close up before. I assume the ‘eyes’ in the design can be pushed in to indicate if one has ‘decaf’ or ‘other’ in that particular cup. A pleasing composition. Oooh! She has a book!!! Easter Island, here we come! I didn’t know Hitler had that cute little heart for a nose. Kind of took the edge off of the rants, you know. The Hitleresque mustache on that lid kind of resembles the one on the actor in the Dunkin Donuts commercials. This is a fundamental principle of gestalt. When confronted with complex shapes, we tend to reorganize them into simpler components or into a simpler whole. You’re more likely to see a face instead of the individual parts that happen to resemble a face (it doesn’t take much, just an arc and 2 dots to Have a Nice Day). I suspect that we are wired to do this (babies that didn’t recognize human faces as quickly were more likely to die, so it’s of survival value). This is also why people are constantly promoting fantasies of creatures on Mars creating mountains that are human faces. ( https://en.wikipedia.org/wiki/Cydonia_(region_of_Mars) )There are many features of the Martian desert and some happen to look a little like a face, but that’s us seeing a face, not some Martian’s structure. Now that’s something that takes muscle control. I like very small airports, where the formalities tend to be – less formal. We recently stayed a few days in Atiu (in the Cook islands) then caught the once-weekly flight to Aitutaki. We were the only two people on the plane and nobody asked to see our tickets (doubtless they were expecting us).